Scott Roeder is charged with killing Dr. George Tiller in his church in Wichita, Kansas. Defense attorney told jurors Roeder believed he had to act. (CNN) -- Jurors started to deliberate Friday after prosecutors and defense attorneys made closing arguments in the murder trial of an anti-abortion activist charged with killing a doctor who performed late-term abortion procedures. Scott Roeder is charged with murder in the death of Dr. George Tiller, who was shot to death May 31 in his church in Wichita, Kansas. Prosecutor Ann Swegle urged jurors to convict Roeder, reminding the jury of the defendant's testimony Thursday. "His testimony was delivered very matter-of-factly, but its contents were chillingly horrific," she said. "He carried out a planned assassination, and there can be no other verdict in this case ... other than guilty." Kim T. Park, chief deputy district attorney, told the jurors that Roeder's actions were unjustified and cowardly. "Scott Roeder is not justified," she said. "He is only and simply guilty of the crimes he is charged with." Mark Rudy, a defense attorney for Roeder, told jurors that Roeder believed he had to act. "Scott thought that the babies kept on dying," he said. 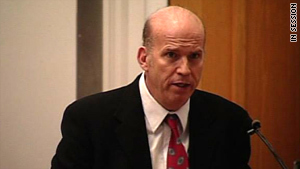 "Scott formed a belief that he had to stop George Tiller from killing more babies." He admitted that Roeder killed Tiller but said only the jurors can decide if Roeder "murdered" Tiller. He said he was not asking jurors "to check your common sense at the door" and urged them to "represent our little part of the nation well." "No defendant should ever be convicted based on his convictions," Rudy said. Roeder testified Thursday that he shot and killed Tiller and did not regret it. Tiller ran a women's clinic at which he performed abortions. Sedgwick County District Judge Warren Wilbert ruled after the end of testimony Thursday that the jury could not consider a lesser charge of voluntary manslaughter against Roeder as the defense wanted. In making the ruling, Wilbert noted that Roeder had been talking about killing Tiller for 10 years, CNN affiliate WDAF reported. Several of Tiller's family members broke into tears as Roeder recounted the shooting. Roeder said he didn't regret what he did and felt "a sense of relief" when he learned that Tiller's clinic was shut down after his death. Roeder calmly testified that he thought about different ways to kill the doctor -- driving a car into his, perhaps, or shooting him with a rifle. He also considered cutting Tiller's hands off with a sword, but decided that would not be effective, as Tiller would still be able to train others. Tiller, 67, was one of the few U.S. doctors who performed late-term abortion procedures. He had already survived one attempt on his life before he was killed. He decided to kill Tiller at his church, he said, because "I felt that actually if he was to be stopped, that was probably the only place he could have been stopped. ... It was the only window of opportunity I saw." Roeder said he visited the church four or five times before Tiller's death. The week before the shooting, on May 24, he carried a .22-caliber handgun with him, he testified, but Tiller did not attend church that day. On May 31, though, the doctor was there, and "I did what I thought was needed to be done to protect the children," Roeder said. "I shot him." "The lives of those children were in imminent danger if someone did not stop George Tiller," he said. The defense had sought to have former Kansas Attorney General Phill Kline and current Deputy Attorney General Barry Disney testify, but the judge did not allow it. Kline unsuccessfully attempted to prosecute Tiller in 2006, and Disney charged Tiller with 19 misdemeanor counts, but a jury acquitted him. Wilbert said Roeder could testify about the cases and how they affected his beliefs, but to allow testimony from Kline would "get into legal matters that do not concern this jury." And, the judge said, the cases do not give Roeder a basis to state absolutely that Tiller's actions were illegal, since the doctor had never been convicted. Defense attorneys claim Roeder was led to shoot Tiller in part because of authorities' failure to punish him through the judicial system. Roeder testified he was "very frustrated" by Tiller's acquittal, saying it "seemed like that was the last attempt by the state of Kansas to find if there was anything at all going on illegally in George Tiller's clinic." Roeder could face life in prison if convicted of first-degree murder. He also is charged with two counts of aggravated assault for allegedly pointing his gun at two other ushers as he fled the church.